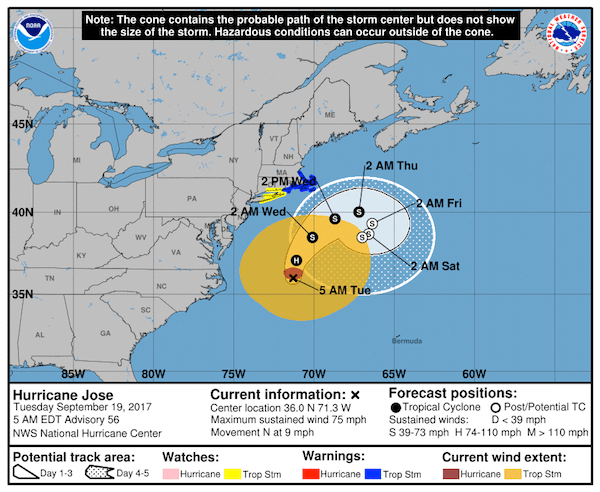 The National Hurricane Center’s 5 a.m. Tuesday Forecast Cone for Hurricane José. Below please find the current cancellations we’ve received due to Hurricane José. To add your cancellation to this list, either enter it in the comment section or email the information to editor@eastendbeacon.com. • The New York State Department of Environmental Conservation has postponed a public hearing scheduled for Tuesday evening in Hauppauge on the third draft of its mute swan management plan due to storm conditions. Unlike earlier drafts, this current plan “gives priority to non-lethal management techniques.” A new date has not yet been set. The draft plan is available online here and comments can be sent via email to Wildlife@dec.ny.gov. • Republican East Hampton Town Board candidates have cancelled their listening session scheduled Tuesday evening at the Amagansett American Legion Hall. We’ll have the details when they reschedule. ← Between the Lines: My ‘Kelly 2020’ Signs Should Be Green, Right?